While I admire M.C. Escher’s unrivalled sleight of hand with tessellated design, his depictions of impossible perspectives and so on, by far and away my favorite piece by Escher is the beautiful etching Three Worlds (above). As a boy in Guernsey I spent days fishing, waiting for the exhilarating moment when you pulled something alive and previously unseen from the sea. Leaning over St Peter Port harbour walls looking down into the water was a formative experience for me, and of course I was only able to glimpse what was near the surface. There was something magical, therefore, about hooking wrasse, little gobies, pollack, garfish, mackerel and so on in the hidden depths, and drawing them into the sunlight. Later, I started to see fishing as a metaphor for the disclosure of what is hidden in the subconscious; it is almost therapeutic. In Three Worlds the elusive carp ghosting under the surface inhabits a submerged place that we cannot live in, and the carp cannot escape. The second ‘world’ is the surface; the floating leaves suggesting the plane where the water and air meet. The third world is depicted by the reflected trees, upside-down and branching into the water, bare against the sky from where the leaves have fallen. Have you ever experienced a fleeting sense of everything being connected to everything-else; that you have glimpsed a greater pattern? Moments like these are often described as mystical*. 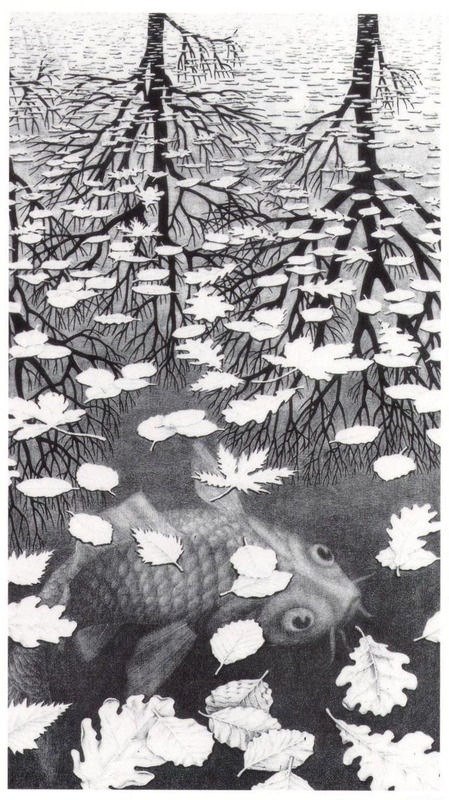 With its interlacing of the submerged, half-hidden world, the leafy surface and the visible world of trees and sky, the woven pattern of Escher’s Three Worlds makes me feel I am looking at a kind of mystical connection. This image connects nature in one frame, but I also think it depicts the conflation of the subconscious and conscious, and where they encounter each other: the decorated, insubstantial surface. And for me, there is something transcendent and magical about this. * Now out of print, the downloadable F.C. Happold’s Mysticism, A Study and an Anthology is still a no-nonsense place to read about Mysticism. This entry was posted in Uncategorized and tagged F.C. Happold, fishing, M.C. Escher, Mysticism, Three Worlds. Bookmark the permalink.